African Pepe Makes it Rite! DURHAM, NC Wednesday, December 26th, 2018– Hayti Heritage Center and The Magic of African Rhythm host the Hayti Legacy Kwanzaa at the Hayti Heritage Center, 804 Old Fayetteville St. Durham, NC 27701. The theme for this year’s festival is New Water from Ancient Wells in recognition and celebration of Durham’s young, gifted and Black millennials innovating on the community’s legacy of culture, entrepreneurship, and activism. Africa Unplugged performs soulful, funky, bluesy dance music. The day-long celebration begins with a documentary film showing, followed by The Children’s Village with interactive activities, workshops for elders and adults of all ages, an evening performance, and candle lighting ceremony. Everyone is invited to partake in African Diasporic music, history and culture workshops provided by BUMP: the Triangle; chess with Coach Eric Zeigler; and a sampling of movement and music classes taught by local arts instructors. Featured band Africa Unplugged brings together the past and the future, using traditional instruments to create a contemporary sound. Food, artwork, clothing, books and crafts are plentiful at the African-inspired Marketplace. The doors open at 1:00 pm. Film showing at 2:00 pm; the Marketplace remains open for the entire day followed by a one-hour Diaspora Arts Sampler at 3:30 pm. The Children’s Village runs from 4:00 pm until 6:00 pm alongside workshops for elders and adults of all ages. The Candle Lighting Ceremony and performances begin at 7:00 p.m. The Magic of African Rhythm’s mission is to connect and reconnect to traditional African culture and values.The St. Joseph’s Historic Foundation is committed to the Hayti Heritage Center, the former St. Joseph’s AME Church, a National Historic Landmark, as a cultural and economic anchor to the greater Durham community. St. Joseph’s Historic Foundation, Inc. is a nonprofit, charitable organization under Section 501(c)(3) of the U.S. Internal Revenue Code. For more information, please call Teli Shabu, 919-638-8221, email: shabufam@gmail.com or visit their website at https://tmoar.wordpress.com/ or The Hayti Heritage Center (919) 683-1709 or visit their website at http://hayti.org/. Hayti’s Harvest: 2017 Kwanzaa Talent! 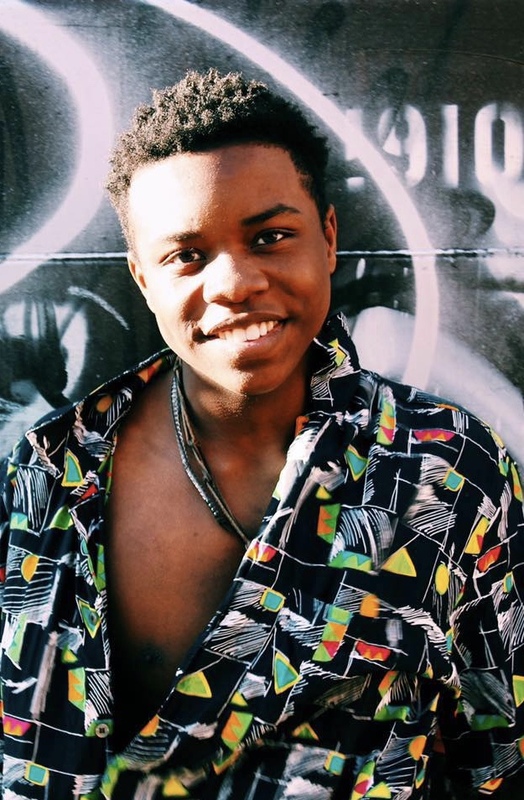 JABU GRAYBEAL is a 16 year old dancer from Pittsboro NC. He has been a member of the North Carolina Youth Tap Ensemble directed by Gene Medler for the past 7 years. 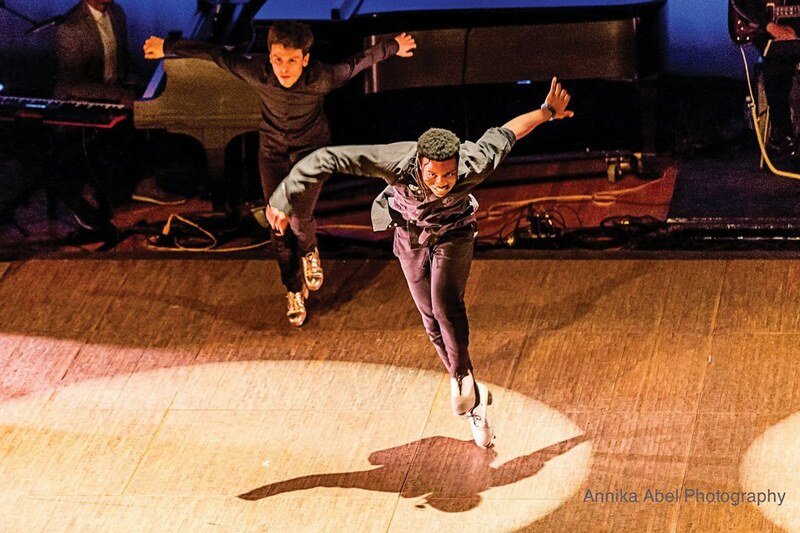 This summer Jabu was accepted to study at the tap dance program at Jacob’s Pillow in Massachusetts and was the first tapper to be accepted by the Berklee Global Jazz Institute Workshop at the Newport Jazz Festival. He was featured in the December 2017 issue of Dance Spirit magazine as one of five up and coming tap dancers to watch out for. 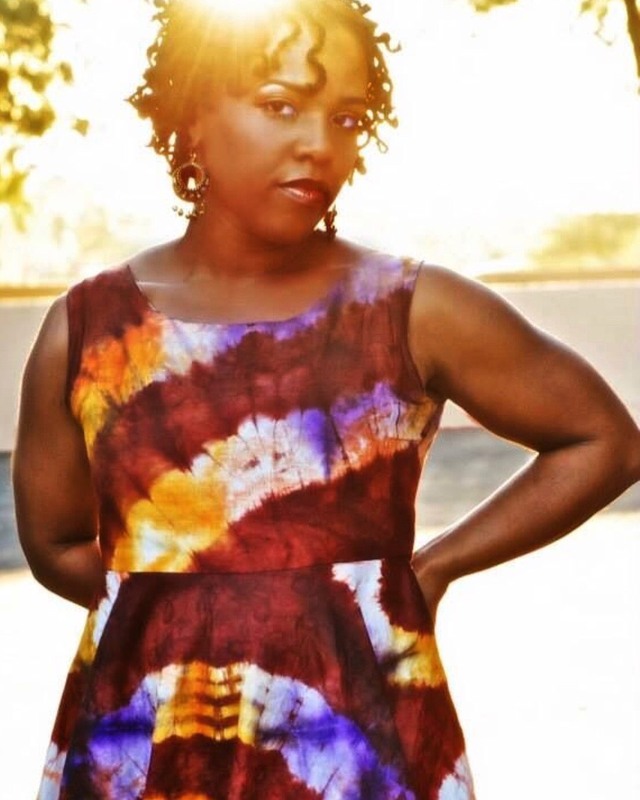 Jabu has performed with several local artists including Pierce Freelon and The Beast, and jazz trumpeter Al Strong. DARRELL STOVER – poet, cultural historian, science communicator, and public intellectual has a long record of community building through direct action, performance, teaching, documenting, and celebrating African diasporic heritage and struggle. His most popular class at North Carolina State University is Black Popular Culture: From the Blues to Afrofuturism. 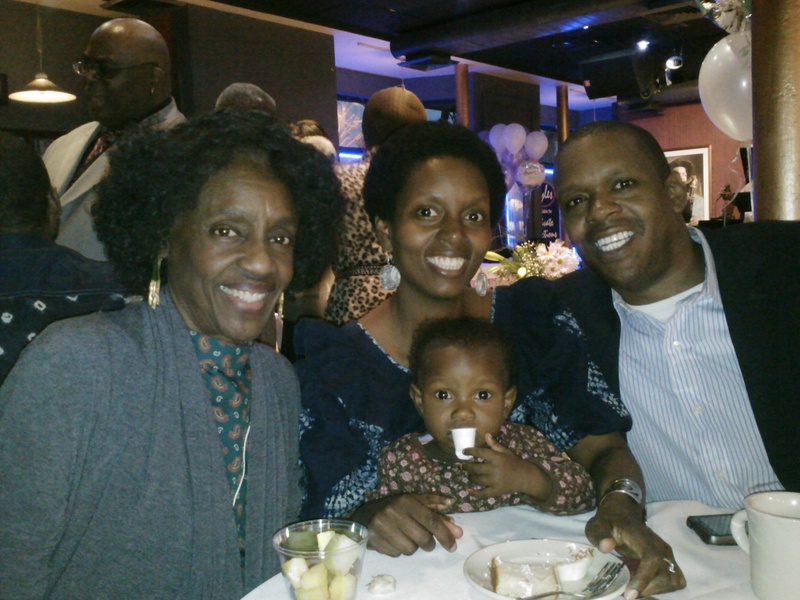 His favorite word is the Kwanzaa principle “KUJICHAGULIA” – Self Determination. ALEX WEISS & DIFFERENT DRUM is a versatile ensemble, based in Raleigh/Durham North Carolina, that takes the rich ethnic sounds of Africa & Latin America and blends them with original compositions & jazz standards. Where will YOU be this Kwanzaa Season? 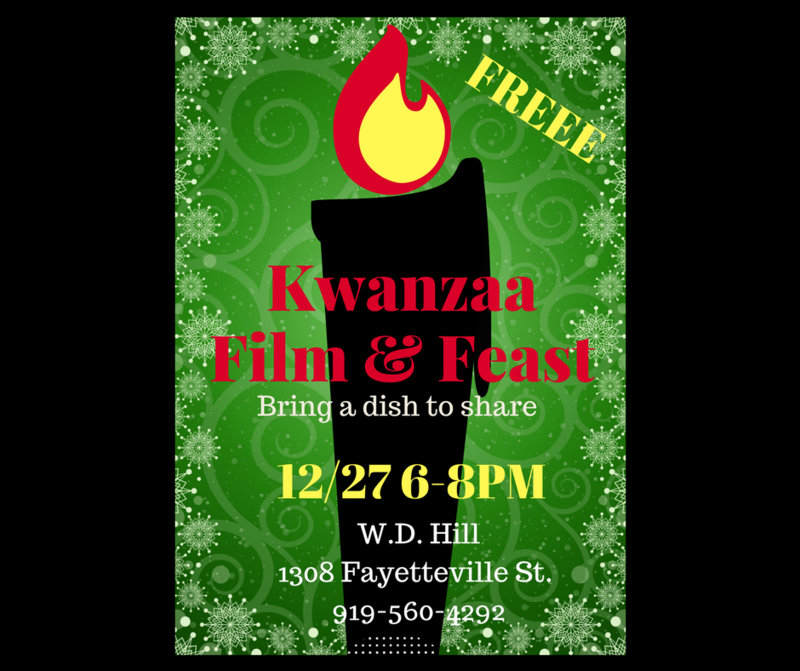 Wednesday December 27th 5-7pm COMMUNITY *KARAMU W.D Hill Center 1308 Fayetteville St, Durham, NC 27707 *Karmau is “feast”. Bring a potluck dish to share. DURHAM, NC Tuesday, December 26th, 2017– Hayti Heritage Center and Shabutaso, Inc. host the Hayti Legacy Kwanzaa at the Hayti Heritage Center, 804 Old Fayetteville St. Durham, NC 27701. The theme for this year’s celebration is Leadership through Service in remembrance of Baba Chuck Davis’ monumental legacy as a global chief who out-gave with his time, his talent, and his treasure both home and abroad. The day-long celebration features a documentary film showing, The Children’s Village with interactive activities for families, and evening performances. Everyone is invited to partake in African Diasporic music, history and culture workshops provided by BUMP: the Triangle; chess with Coach Eric Zeigler; and a sampling of martial arts, dance and drum classes taught by local arts instructors. There special performance tributes to Baba Chuck by Alex Weiss & Different Drum, DanceSpirit Magazine’s “next generation of stars” pick Jabu Graybeal, and special guest appear by the always soulful Shana Tucker! 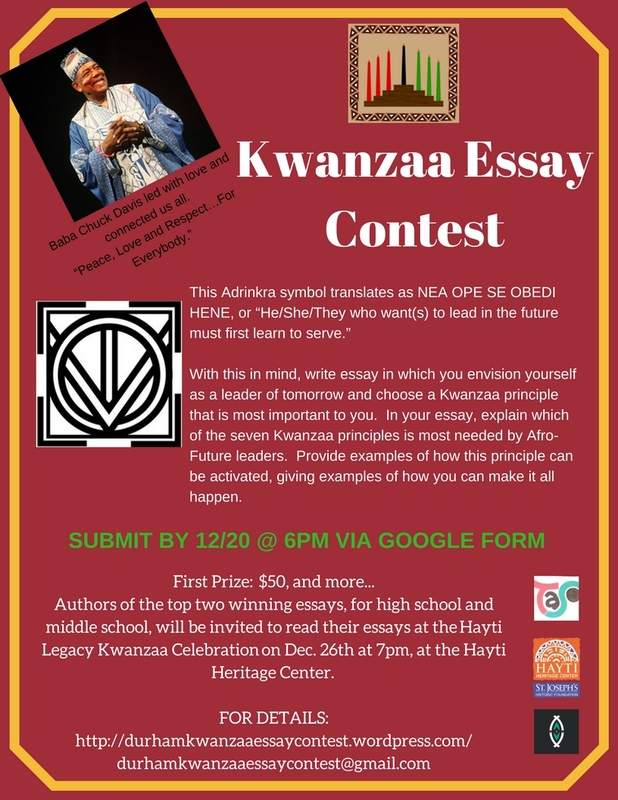 This year will mark the first Annual Kwanzaa Youth Essay Contest with performance opportunities and cash and other prizes. Food, artwork, clothing, books and crafts are plentiful at the African-inspired Marketplace. The doors open at 1:00pm with the film showing. 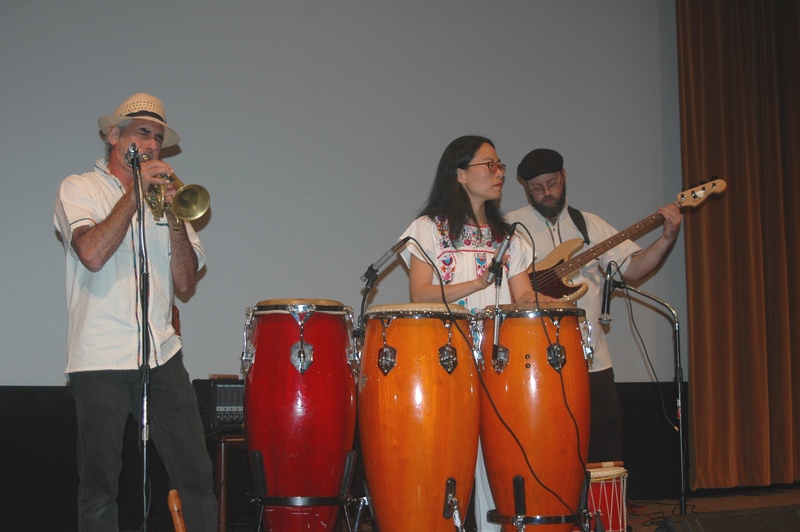 At 2:00pm the Marketplace opens for the entire day followed by a one-hour Diaspora Arts Sampler at 2:30pm. The Children’s Village runs from 4:00pm until 6:00pm. 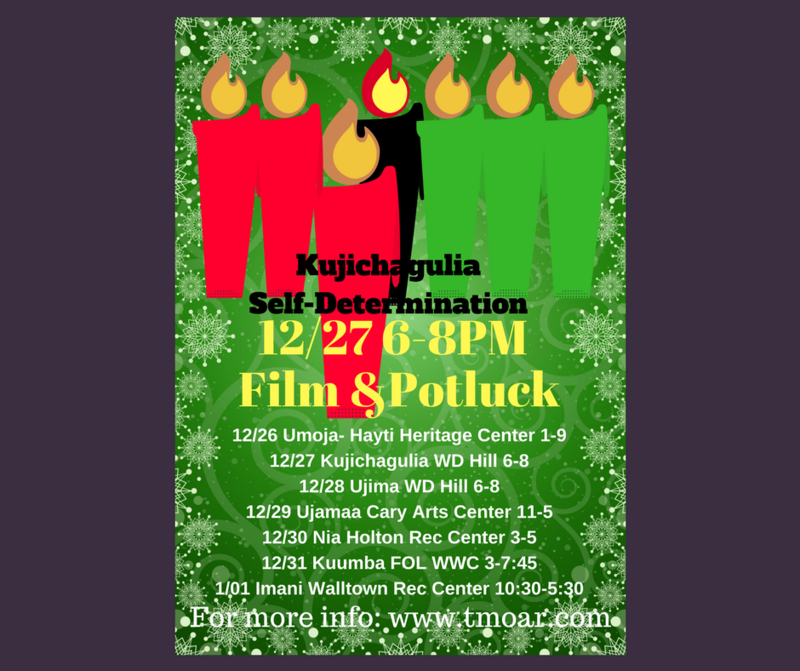 The Candle Lighting Ceremony and performances begin at 7:00 p.m. Click here for more Kwanzaa Across the Triangle Events. 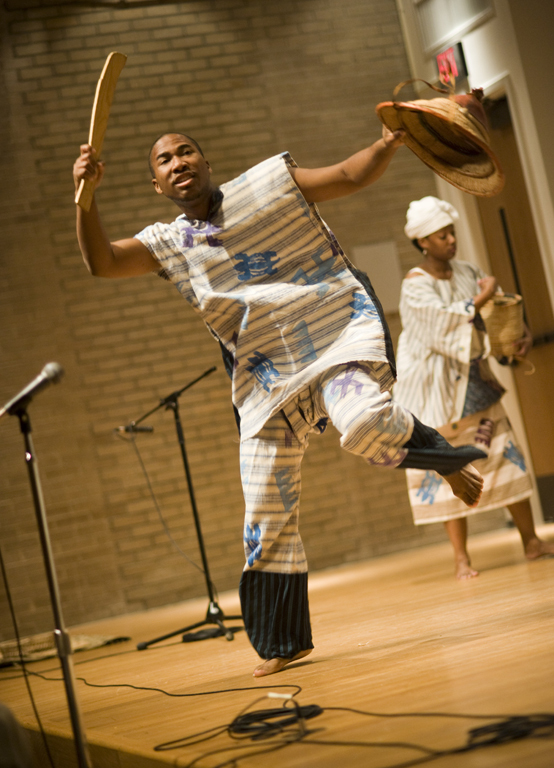 Shabutaso Inc. is a nonprofit 501(c)(3) connecting and reconnecting to traditional African culture and values. The St. Joseph’s Historic Foundation is committed to the Hayti Heritage Center, the former St. Joseph’s AME Church, a National Historic Landmark, as a cultural and economic anchor to the greater Durham community. St. Joseph’s Historic Foundation, Inc. is a nonprofit, charitable organization under Section 501(c)(3) of the U.S. Internal Revenue Code. For more information, please call Aya Shabu, 617-959-2076, email: shabufam@gmail.com or The Hayti Heritage Center (919) 683-1709 or visit their website at http://hayti.org/. Pine Cone in partnership with North Carolina Museum of History present Music of the Carolinas Concert Series featuring Balankora: A Harvest of Memories. 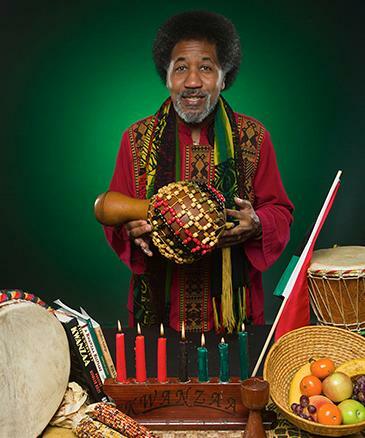 Musicians from The Magic of African Rhythms share the beauty and spirit of Kwanzaa through music and stories. 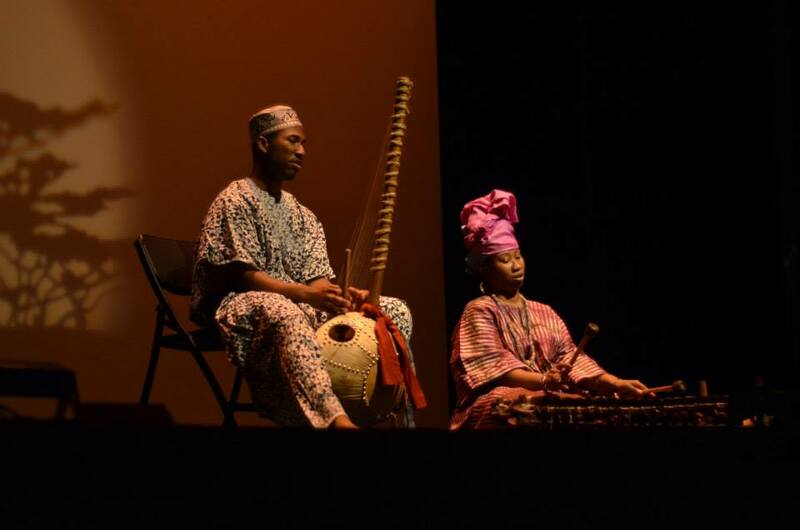 The sounds of the balan and kora – griot instruments from West Africa – reconnect audiences to distant traditions. Kwanzaa is a seven-day festival that celebrates and teaches about the Seven Principles (Swahili: Nguzo Saba) of African culture which contribute to building and reinforcing family, community, and culture among African American people as well as Africans throughout the world African community. These values are: unity; self determination; collective work and responsibility; cooperative economics; purpose; creativity; and faith. Free and open to the public; free tickets required. Tickets distributed first-come, first-served beginning at 2 p.m.
A ramp from Edenton St provides access to the Museum’s main entrance. A ramp is also available from Jones St. Wheelchairs for interior use are available free of charge at the Museum information desk. The Museum entrance closest to the auditorium is a staircase that leads up to glass doors on Edenton St.
Large print program notes and assistive listening devices will be available. Please call PineCone’s office at 919-664-8333 if you have any questions, or contact the Museum directly: 919-807-7900. Canned goods will be collected at the event for the Food Bank of Central and Eastern North Carolina at this concert! Last night I attended my first Village of Wisdom (VOW) Black Genius Workshop last night. Let me first state how much I LOVE that the acronym VOW affirms the work they are doing on behalf of black families and P.O.C. Each time I see it/say it (VOW) I am giving myself a call to action, a call to commit, a call to care. Let me see if I can paint a picture of how the evening went. I arrived involuntarily late – 6:30 instead of 6pm. Shoot! A large VOW banner directs my eleven year-old son and I underground toward the administrative offices at Northgate Mall. We walk into a very large carpeted room were children of all ages are playing. My son immediately spies two of his friends from school. Phew! I’m thankful that there’s planned childcare. I follow the signs that lead to a conference room. A young man wearing a bright red t-shirt that reads “Black Genius” greets me at the door. I sign in and am instructed to take a brightly colored “Black Genius” folder and a small “Black Genius” notebook and pen. Well equipped to participate and take notes, I find a seat among the semi-circle of parents and mix of older and younger children who are busy with plates of sandwiches, bags of chips and crackers, cans of sparkling juice and water. I quickly sit down and tune into the conversation in progress. Parents are casually talking to one another about their children and offering affirmations about them. Wait! This is the icebreaker. I realize that I no longer need to rush- that VOW has been intentional about childcare, food, and the need for a buffer between self/family-care and the battles of work, traffic, and bills. I end up sitting next to a neighbor and friend and meet several other friendly-faced parents. The facilitator invites parents to wrap up their conversations and tune into the power point presentation. Her tone is warm and familiar. The rustling of children does not phase the facilitator nor causes her to raise her voice. To her, these ambient noises are the welcome sounds of strong families. Parents lean in making the space that more intimate. The facilitator talks slowly and deliberately. The conversation is engaging and interactive with ample opportunity for parents to ask questions and hear one another’s stories. My partner for one of the activities was a beautiful Muslim woman; she was a new mother. As she spoke about her talented and precocious son, her eyes sparkled and I drank in the wonderment of parenting for the first time in many years. She asked me about my homeschooling journey and we made plans to stay in touch. By the end of the workshop, I felt listened to, offered myself as a resource, and was fed by new ideas and information. The pace of the evening and activities allowed me to grasp VOW concepts and strategies without feeling overwhelmed or worried how would I ever remember or be able to implement all of this information. With full receptivity and transparency VOW invited the parents – “the village” in the making – to be part of an evaluation of the workshop. An easel, flip chart and markers came alive as “the village” offered “pluses” and “deltas”, or “triangles” as one parent called them. The feeling in the room was one of instant community as if we’d all been working together for weeks, rather than meeting for the first time many of us. VOW provided a framework and a container for successful community building and we were invited to take these strategies home and “build” with our own families. That chlly November evening began with a list of numerous appearances I would make at different events between Durham and Raleigh, but I’m glad I made the vow to attend the Black Genius Workshop. 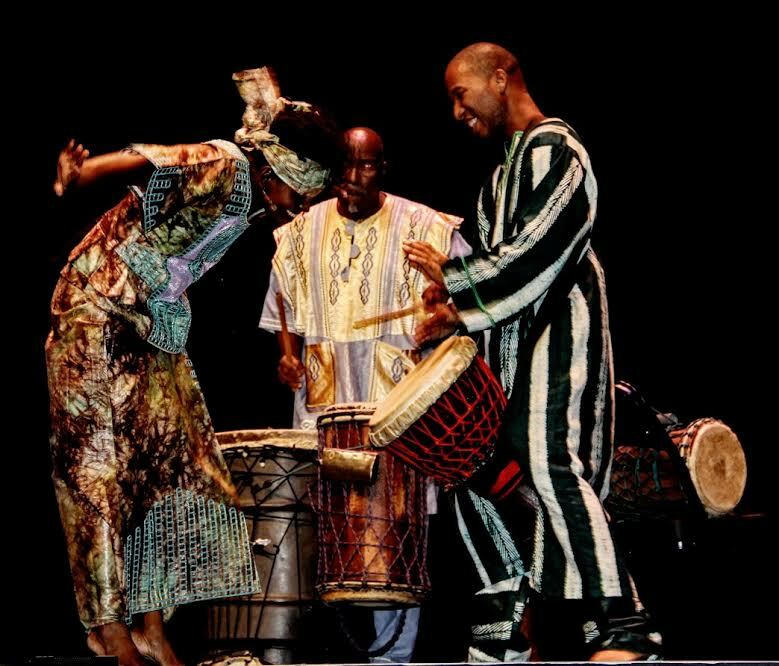 SATURDAY ON OCTOBER 8TH, SHABUTASO WILL BE DELIVERING ANOTHER DYNAMIC PERFORMANCE OF AFRICAN DANCE AND DRUMMING AND AN AFRICAN DANCE WORKSHOP AT SHAKORI FESTIVAL IN PITTSBORO N.C. AT 2PM. JOIN US ON SATURDAY FOR THE FESTIVITY AND EXCITEMENT AS WE SHARE AND SUPPORT VENDORS AND ENJOY WONDERFUL MUSIC. PLEASE CLICK ON EVENTS TO SEE OUR CALENDAR OF UP COMING PERFORMANCES.